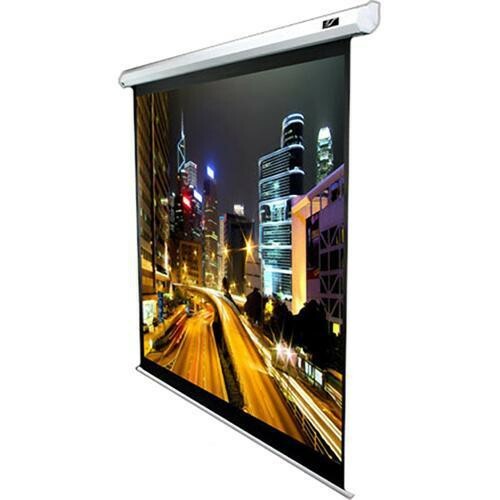 The Elite 60 x 80" VMAX2 Motorized Front Projection Screen is designed for both home and commercial use. This screen features a synchronized motor that ensures quiet operation along with low power consumption. The MaxWhite viewing surface has a very wide viewing area - 160° - making it easy to see the projection from just about anywhere in the room. The included remote controls allow you to control the show from the comfort of your chair. The RF control has an operational distance of about 100' - and does not require line-of-sight. The screen arrives fully assembled and even includes a handy bubble level to assist in accurate installation. The screen itself is of plug 'n play design. The standard 3-prong plug doesn't require any fancy electrical connections - take it home, plug it in and you're ready to watch your show. Box Dimensions (LxWxH) 95.8 x 5.5 x 5.5"